Fast growing upright semi tropical perinneal shrub Prolific summer bloomer Clusters of bright blue phlox like flowers Great gift for a gardener of any skill level May be grown potted indefinitely. 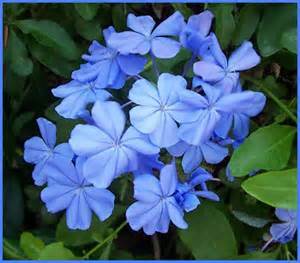 Plumbago is a fast growing, quick to establish upright semi tropical shrub. Blooms in abundant clusters of 5 petaled flowers in a bright blue hue. These are mature, well rooted starter size plants, growing and shipped in 4 inch diameter pots. Plants will generally average about 8 to 10 inches tall and will not have bloom or bud when they arrive.